The difference between cool weather and warm weather grass types. Which climate zone you live in. When you should plant your grass for the best results. How to prepare your home for vacations, extended leaves, or before selling to keep your pipes from freezing. A lush green yard is the envy of every neighborhood, but it can be a challenge to obtain. There is much more to green grass than simply sun and water! A beautiful green yard is often the result of using the correct fertilizer, aeration technique and type of grass seed. The time in which the grass seed was planted is also an important factor. To complicate matters further, the type of grass seed planted and when to plant it varies from state to state. However, there are a few guidelines to go by to help get your lawn green and ready for the warmer days. In general, there are two categories of grasses, cool weather and warm weather grasses. These two categories can then be divided into types. Cool weather grass types include Kentucky Bluegrass, Fescue and Rye. Warm weather grass types include Bermuda, Zoysia and St. Augustine. As you might expect, these grasses grow better in their respective climates. Cool weather grasses grow better in areas that have cooler summers and winters and warm weather grasses grow better in areas that have warmer summers and winters. This does not mean that a cool weather grass cannot grow in a warmer climate or vice versa. However, it does mean that if you plant cool weather grass in warmer climates you will have to do extra work to maintain it. This extra work may include reseeding in the fall, especially if the summer is very hot, as the cool weather grass will likely die off. To complicate grass selection further, the United States National Arboretum has divided the US into four different climate zones for turf grass. 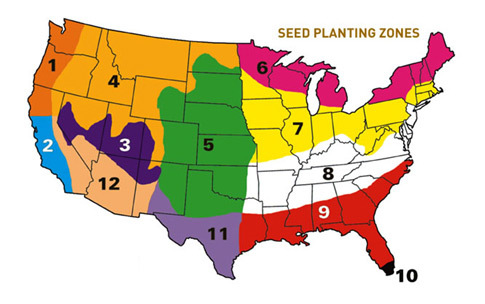 These four zones and a large transitional zone in the central and eastern part of the country can help make the process of selecting grass seed easier. 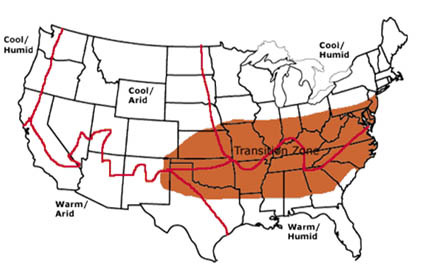 These four zones are cool/humid, cool arid, warm/humid, and warm/arid. Unfortunately, some states are divided up into several of these zones. Even worse, California and Texas are divided into three different zones. Cool/humid regions support cool weather grasses like Bluegrass and Fescue although in the more southern portions warmer grasses can grow. Cool/arid regions also support cool weather grasses as long as there is ample irrigation. According the National Arboretum, warmer grasses such as Buffalograss is a good choice for areas that are not irrigated since they are more drought tolerant than cool weather grasses. Similarly, Buffalograss is a popular choice for warm/arid locations because of its drought tolerant characteristics. The most commonly used warm/humid grass is Bermuda grass although the further North in the warm/humid region you live the greater the chance of winter damage to Bermuda. Unfortunately, if you live in the transitional area of the country you can be a bit out of luck. No specific grass type is well adapted for this area. Because of this, you may have to plant both warm and cool weather grasses. If you opt for this consider planting cool weather grass seed in the early fall and then in the early spring overseed your lawn with warm weather grasses. This will give you the coverage for the seasonal changes while exploiting the best characteristics of each grass. It will require more work, but it will help you obtain that beautiful green lawn you always dreamed of. Seed cool weather grass seeds in late summer to early fall. This gives these grasses the best chance of survival. They don't have to deal with the heat of the summer and established grass will start going dormant soon which will give your growing seeds a better chance of grabbing up essential nutrients. 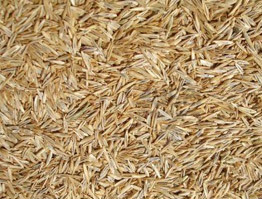 Seed warm weather grass seeds in early spring and into the summer. Wait until temperatures get above 65°F during the day and then seed. This will allow the warm weather grasses to get the benefit of warm temperatures that come with summer while giving them time to become established prior to cooler weather in the fall. Plant in regards to the grass seed and not the area you live in. For example, if you decide to plant warm weather grass in a cooler climate then sow the seeds in the spring when temperatures have risen and not in fall. Pay attention to your USDA zone. USDA zones are also climate zones and are generally used for gardeners and landscapers as a guideline for planting. If you have ever looked at the back of a packet of seeds, you'll notice the colored map on the back with a breakdown of what the colors mean. This is a simplified version of the USDA map. The full version outlines temperature changes for the entire country. The map will help determine when the last frost should be in your area and when temperatures will be optimal to start planting grass. Researchers at the National Turfgradd Evaluation Program (NTEP) have done copious amounts of research on the best time to plant grass seed. To make their research a little less confusing we’ve converted their data into an easy-to-read chart. The chart breaks down the best choices for grass type in your state as well as when to plant and what your USNA and USDA regions are. While grass can grow at almost any time within the growing season, there are a couple of local weather considerations to make. First, look for any storms that may be coming up. You’ll be more successful if you sow the seeds just prior to a rain shower. However, it you plant the seeds just prior to a down pour or thunderstorm you may literally be washing your seeds down the drain. Some rain will help your seeds germinate. Too much rain will cause the seeds to runoff towards storm drains, especially on virgin or prepared soil. On the other hand, if you plant seeds during a drought it will be very difficult to keep them irrigated enough to help them establish roots. If you have an opportunity to select the time you plant wait until the day before or the day of a rain shower to sow your seeds. Secondly, do not plant during an extreme cold snap or heat wave. These abnormal temperatures will make it difficult for the seeds to germinate. 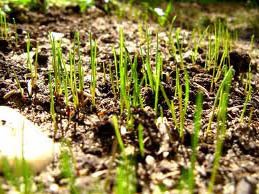 After you plant your grass seeds, you should see new sprouts no later than two weeks afterwards. In some circumstances, you may see them in only a few days. If it has been two weeks and there are no grass sprouts or very few then reseed and make sure you water thoroughly. I have found that the most important factor when planting grass seed is water. So, when you plant seeds be sure to irrigate the grass frequently and make sure you irrigate well. The dirt should remain moist during germination; just make sure that you don't create a lake in your yard as you water. Finally, to ensure fast germination and to help create a greener lawn, consider these final tips. First, keep feet off the area as much as possible. Grass seed germinates and grows best in dirt that is loose and not compacted. Stepping on the soil could make it difficult for grass seed to take. Secondly, make sure there is plenty of water during the first few weeks of growing. Finally, to help the grass seed take quicker and grow stronger, faster amend your soil. This can be done through fertilizers but I recommend a top dressing of good quality compost. The compost adds the necessary nutrients for plants but also helps keep the soil from compacting.